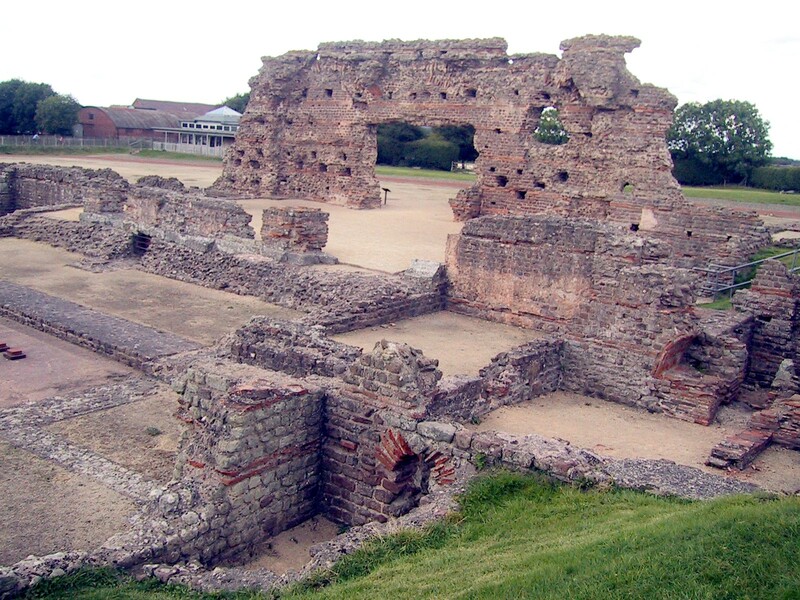 Wroxeter, near present-day Shrewsbury. Although the basilica of the Roman baths fell into disuse around 350 CE, a later phase of large wooden buildings with classical facades was constructed around 480, demonstrating a high level of civilization. Then Arthur along with the kings of Britain fought against [the Saxons] in those days, but Arthur himself was the war-lord. ... The twelfth battle was on Mount Badon in which there fell in one day 960 men from one charge by Arthur; and no one struck them down except Arthur himself, and in all the wars he emerged as victor. Last week, we saw that Britain was left virtually defenseless against invaders from the north and from continental Europe after the Roman legions left the island in 410. But we also have many clues and half-clues that the Britons living in the region now called England, inspired perhaps by a Che Guevara-type leader -- Arthur? -- put up a good fight, at least for a while. Archeologists know that the entire country didn't immediately sink into anarchy after the legions left, pointing to such sites as the Roman cities of Dorchester and Wroxeter, where civilized town life continued for at least another 200 years. Also, many Iron Age (c. 600 BCE - 100 CE) forts were rebuilt in the late fifth century, evidence of organized resistance. The earthworks of Somerset's South Cadbury, for instance, were strengthened around 470, and digs there have unearthed Mediterranean pottery and remains of Roman-style buildings from that time. More telling, perhaps, is the curious pattern of continental-style graves and pottery, which are abundant in the lowlands of south and east Britain beyond London from before 500 and again after 600. That century-long gap seems to indicate a period when Anglo-Saxon invaders were held at bay. Which brings us to the battle of Mount Badon "the last great victory of the fatherland," according to the monk Gildas, writing around 540. Tellingly, perhaps, he doesn't mention Arthur. That was left to another monk, Nennius, writing three centuries later, who claimed that Arthur single-handedly slew 960 of the enemy. Historians are pretty sure that at least one major battle was fought around 500 CE in which Britons decisively beat the invaders, but they are divided on where it happened, and whether a British (or Romano-British) general called Arthur led the defending forces. One prominent theory holds that Mount Badon was Badbury Rings, a large earthen Iron Age fort located in east Dorset. Badbury was one of the strongholds refortified around 500, and that, together with the similarity of the names Badon-Badbury, has led some historians to propose that a warrior named Arthur led British forces to a decisive victory there, in what Lord Alfred Tennyson poetically called "the last dim weird battle of the west." However thin the evidence, Arthur's legend lives on today, in countless books and movies. Next week we'll see how a semi-historical Arthur was transformed into the myth of the "once and future king." Barry Evans (barryevans9@yahoo.com) likes to think his Celtic forebears fought alongside Arthur. He is teaching a course at OLLI (826-5880) on King Arthur, dinosaurs and the Seven Wonders starting Nov. 7.